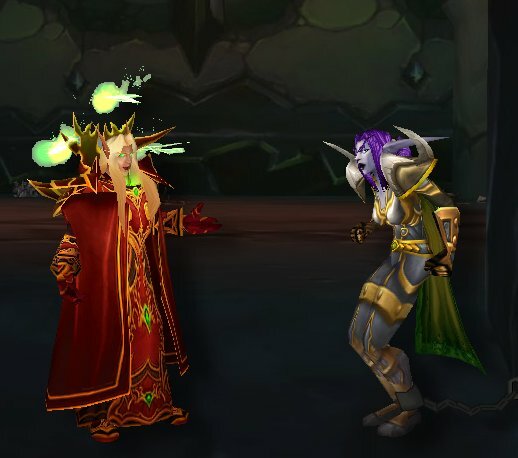 "Your Highness," said the blood elf in the doorway. "You asked to be alerted when the prisoner was awake." "Yes, thank you," Kaelthas said, rising from the table where he had been fruitlessly poring over a book of ancient curses and healing. He hastened down the spiral staircase into the cell where Maiev Shadowsong was being kept. Bereft of her helmet, with one leg chained to the stone wall, Maiev should have looked utterly defeated and helpless. Instead she glared at Kael with all of her usual venom. "Let me out of here." He walked into the cell but stopped well out of her reach. "Now why would I do that?" "You have a one-track mind, dont you?" "Where is he? How is he? Tell me," she demanded. Kael hesitated a moment, then sighed. "There has been no change in my lords condition." "What is going on, Warden Shadowsong? Is your pride so inflated that you refuse to see him die at anothers hand?" "Thats not it. You dont understand! How can you, when I dont understand myself?" A tinge of desperation appeared on Maievs features. Kael changed his posture, relaxing slightly. Dropping formal titles, he looked her in the eye. "Maiev, youve nothing to lose. Talk to me. Explain why youre frothing at the mouth for Illidans execution one moment and begging him to survive the next. What do you want?" "I dont know what I want!" she shot back, narrowing her silver eyes in anger. "But it doesn't matter. It is my sworn duty to keep Illidan locked away. Do you know what happened, why he came to be called the Betrayer?" "He sought to recreate the Well of Eternity." "Yes! The Well! The beacon that led the Burning Legion to our world in the first place!" "And the source of our magic power," Kael added hungrily.
" Maiev dropped her head with a shuddering sigh. "And yet hating him is not enough." I cannot live without him." Maiev gasped as if he had struck her. "How dare you--?" "You dont deny it?" Kael smirked. "Of course I do! I hate him! I loathe him!" Kael shrugged skeptically. "I know the sting of unrequited love, Maiev, and you resonate with it." "What makes you think its unrequited?" He raised an eyebrow. "What makes you think it isnt?" Ten centuries we were together, beneath that mountain. Hate? Love? Pain? Pleasure? Theyre just words. What has passed between Illidan and me is something else. Something only we can understand. But know this: he is mine." She glared at him but said nothing. Kaelthas shook his head. "I guess it doesnt matter now, anyway. He grows weaker by the hour. What sort of damage that accursed runeblade caused, I cannot say. The forces commanded by the Scourge are darker than anything I have studied." "Take me to him." She drew herself up to her full height and met his gaze with her most commanding air. "Maiev, theres nothing you can do." "Perhaps not. But what do you have to lose?" at this point it might be a mercy." He removed the chain binding her to the wall and led her out of the cell with a firm grip on her arm. Illidans chamber within the Black Temple was large but sparsely furnished. A wide, low bed on the far side of the room was bathed in soft light from twin lanterns. Dark blue curtains were pulled back to either side, making room for the three blood elven priestesses tending to the unconscious demon hunter. Their pale golden hair and red-and-white robes shone faintly in the dim light. The priestesses stopped their quiet chanting to bow before the prince when he entered the room. "Leave us," Kaelthas said flatly. The other elves were clearly surprised, and one sent a distrustful scowl in Maievs direction, but they exited without comment. Kael released Maievs arm and she rushed across the empty expanse of floor toward the pool of light. "Illidan," she breathed, perching on the edge of the bed to get a closer look at him. One full day had passed since the battle at Icecrown. Illidans skin had taken on a pale, ashen look. Maiev put a hand on his brow and found it cold to the touch. Was he already dead? No. His broad chest still slowly rose and fell with each labored breath. As she watched him breathe, she suddenly realized that the cold was spreading. From her palm, through her wrist and then past her elbow. She quickly removed her hand, and felt the natural warmth slowly return to her body. "This is no ordinary injury," she said, rubbing her arm. "It was caused by no ordinary sword," Kael said. 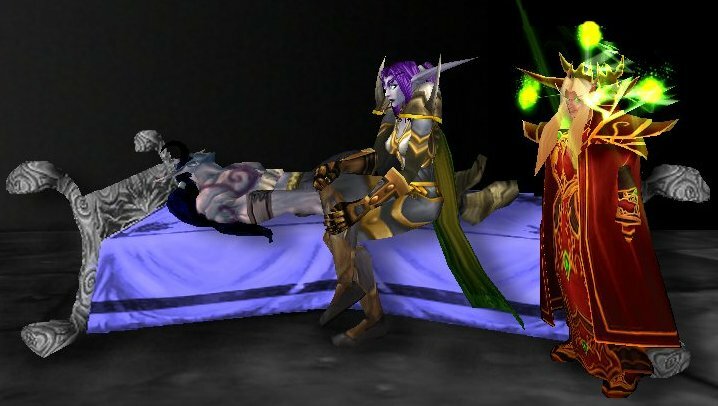 Maiev sat for some time, simply staring at Illidan. Then, with a weary sigh, she turned to the blood elf. "I was not always a Warden." It seemed a random comment, and Kael waited for her to elaborate. I was a priestess of Elune." Kaels eyes widened, trying to reconcile that beatific image with the abrasive Maiev Shadowsong that he knew. well, over ten thousand years." She glanced at Illidan again. "I do not know if the Goddess will still listen to me, after all that has passed. I do not know if She can even hear me in a place so far away and tainted as this. And I do not know if even She can forgive this wretched creature." She regarded Illidans horns with a troubled look. "But I have to try." Kael nodded slowly. "We have nothing to lose." He took her hand and squeezed it firmly. "My people left our reverence for Elune behind when we fled across the sea, but I wish you luck, Maiev. I dont understand you. Im not even certain I like you. We have faced battle both as allies and as enemies in the past. I cannot trust you. But for the sake of my master, the one who saved my people, I give you this chance. Do not disappoint me." "Thank you, Kael. Now get out of here." He smiled dryly at her impertinence and left, barring the door from the outside.